President Donald Trump is arguing that he did all he could to confront Russian President Vladimir Putin on election meddling and said he told Putin the U.S. “can’t have a scintilla of doubt” about the integrity of future votes. Trump told reporters aboard Air Force One en route to France on Wednesday that Putin twice denied any meddling and the president asked what more he could have done. The White House originally said Trump’s comments would be off the record, but reversed itself on Thursday. The comments came hours after a joint news conference with French President Emmanuel Macron, during which the president defended his eldest son’s meeting with a Russian attorney during last year’s presidential campaign. Trump says “most people would have taken that meeting,” contradicting his incoming FBI director’s testimony that Donald Trump Jr. should have instead alerted authorities. Trump is continuing to downplay the issue, saying “nothing happened” as a result of the meeting. The president says the Russian national involved wasn’t a government lawyer. However, the emails his son received pitched her as one. Trump says the woman is a private attorney who has “roamed the hallways” of the U.S. Congress. 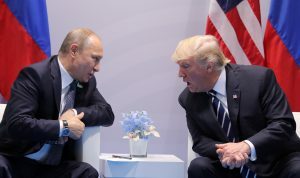 Left: U.S. President Donald Trump speaks with Russian President Vladimir Putin during the their July 7 bilateral meeting at the G20 summit in Hamburg, Germany. Trump is arguing that he did all he could to confront Putin on election meddling. Photo by REUTERS/Carlos Barria.